Results for Product Code "AF604A"
Increased distances between the console switches and interface adapters allow for more flexible configurations including three level tiering. Can be tiered under HP IP Console Switches with Virtual Media to provide remote access and remote virtual media. Supports c-Class BladeSystems with the new interface adapter. USB connectivity provides easier cable management and flexibility in consoles. Local USB pass-through provides an easy method of updating and installing firmware, applications, and operating systems directly to attached servers. Firmware updates for the switch can now be accomplished over the LAN. The new PS2 Interface Adapter provides the most comprehensive virtual media capabilities on many servers, both old and new. The new USB 2.0 Interface Adapter provides virtual media capabilities on servers that do not support PS2 mouse and keyboards. 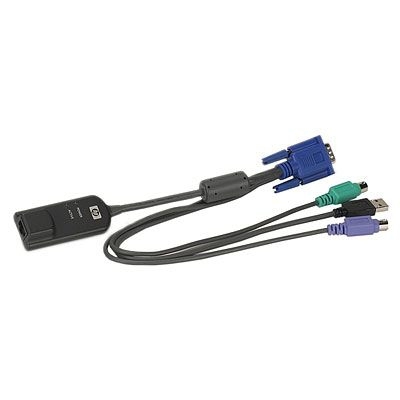 KVM functions work with all existing HP Cat5 based PS2, USB, and Serial Interface Adapters. Local security prevents unauthorized access. I want to record my thanks and to say how very impressed I am with your swift and attentive service!! I will certainly recommend you to friends and use your site again myself. I want to make a point of thanking you very much for all the trouble you went to in getting the product to me. The fact that you visited the Post Office in Victoria Street West to ensure the order got to me was most impressive. You went beyond expectations, Peter, and I am most grateful. I will certainly be recommending your company to others.